Downtown Seattle is just a quick bus ride or only 10 minutes on the Link light rail. Often on my wanderings, I just like to admire the architecture and character of the city. It's no New York or Los Angeles, but there is a distinct feature to each building that just makes it so "Seattle". There's a mix of old and new, historic and contemporary, and they blend so seamlessly. The city is quiteeclectic. Yet, you know when you've walked into another neighborhood just by how the buildings change. SODO is practical whereas Pioneer Square is classic and draws on the past. There's something for everyone. This is a compilation of a few skyscrapers and buildings that have caught my eye. The marvelous little brainchild of super-architect Rem Koolhaus, it doesn't look like your typical library. You'd expect it to be the new art museum or something of the sort. The postmodern architecture is a drastic change from the normal architecture in the area. With a geometric glass and steel facade, it is both visually stimulating and thought provoking. Besides all of these bells and whistles, I get so much homework done here! Not much commentary here, just look up! 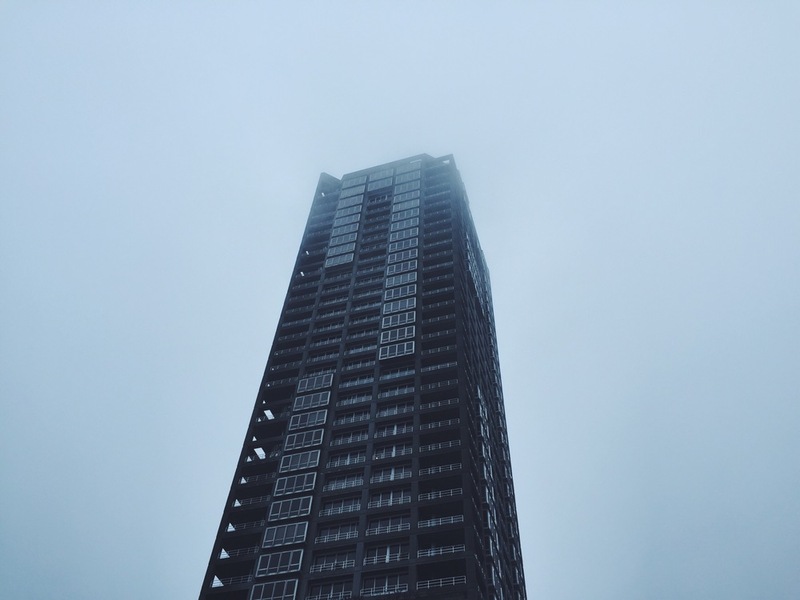 These skyscrapers are always smothered in fog during the rainy times of the year. I discovered this gem one day when I was cutting through Macy's to avoid the rain. As you can tell, on sunny days it's even better with a clear view of Third Avenue cutting through downtown. People also stared at me when I took this picture, but how can you not capture this beauty? Probably one of the cutest areas of Seattle, every building takes a trip back in time to late 1800's when it was the city center. Buildings have ornate façades made of brick and careful masonry. Smith Tower, the white building picture below, resides down here, which at the time was the tallest building west of the Mississippi. A few streets over is the Columbia Tower, the tall black building, which is now the tallest in Seattle. Probably one of the best kept secrets of Seattle, the Russell Investment's Center has a killer rooftop-deck on the 17th floor which happens to be open to the public. The catch? It's only open during the work week. Still, this place treats you to some spectacular perspectives of the downtown area, with glimpses of Pike Place Market and the Puget Sound. I like to come up here to get work done or just relax and take in the gorgeous view. I couldn't exclude the Space Needle from the list even though it's not really a skyscraper. It is the most recognizable landmark in Seattle though! Built in 1962 for the World's Fair, the Space Needle was an icon of the future and technology. Now, it serves as a fun tourist attraction with sweeping views of the city and Cascade Mountains. Out of all of the places I've been, Seattle has one of the most iconic skylines. It's a beautiful place with beautiful architecture!